Today Readdle announced the release of Scanner Pro, an application that transforms the iPhone into a portible PDF scanner. Readdle announced Cannons about a month ago and it has finally hit the App Store. Cannons is a pirate-themed puzzle game. The object of the game is to rotate the tiles (which contain pieces of rope) to create fuses and thus fire cannons. “This is a story about vicious pirates, great sea battles and enormous treasures. Take command on the ship, blow up your enemies and find the hidden gold in this Rocket Mania inspired puzzle game! Cannons will be available in the App Store in the next week or so and will be priced at $2.99. Full press release below. Check out a demo video and more info about the app HERE. Odessa, Ukraine – July 28, 2009 – Today Readdle announces the upcoming launch of Cannons, a pirate-themed puzzle game, on the Apple App Store. Cannons utilizes a classic puzzle genre with addictive story driven gameplay, three action packed game modes, an innovative ship upgrade system and worldwide scoreboard. 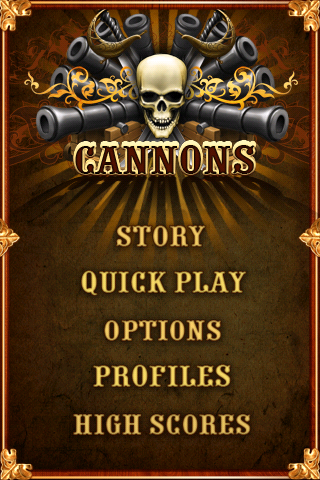 Cannons is a story about vicious pirates, great sea battles and enormous treasures. Players take command on the ship to fight enemy captains and fortresses in a quest to obtain the gold. The battle is based on linking tiles with fuses to a burning torch thus firing on-board cannons. By firing multiple cannons at once players can earn coins that can be used to upgrade the ship’s weaponry. “Stunning graphics, a compelling storyline, three distinct game modes, and an online scoreboard system—all essential ingredients of a really good iPhone game; however, only precisely-tuned controls and gameplay as addictive as Cannons can elevate a good game to this level of greatness. There are few truly original puzzles on the App Store that can keep people entertained for hours and there is no doubt that Cannons is certainly one of them,” – said Alexander Tyagulsky, Readdle CMO.